QTWTAIN, for the uninitiated, is an acronym of ‘Questions To Which The Answer Is No’ that was originated by journalist John Rentoul. It refers to the age-old tactic used by commentators to create a sensational story out of nothing by writing “headlines in the form of questions to which the author or publisher implies that the answer is yes when anyone with any sense knows it is no“. This weekend, the front page of the Financial Times Life & Arts supplement was adorned with a blatant QTWTAIN. Matthew Garrahan’s article has been forwarded on to me by pretty much everyone I’ve ever met with a comment along the lines of “ooooo sounds like the death knell for your boring blog MATE; you will have to find something even more niche to write about now (if such a topic even exists)”. To save myself the hassle of coming up with a suitably hilarious, whilst seemingly-well-informed, response to each of them, I thought I would pen a short retort here. There is certainly a big consumer trend towards ad-blocking & ad-avoidance that is challenging the ad industry as a whole (though this doesn’t impact political advertising any more than it does those seeking to promote soap powder). There hasn’t been a standout political ad of the 2016 US Presidential campaign (though this is a subjective observation and may be contradicted by response and tracking data). The Remain campaign’s roster of ad agencies didn’t manage to land a piece of creative that captured the imaginations of the nation in the same way as we have sometimes seen in previous elections (though this says more about the difficulty of the brief & political context than it does about political advertising as a discipline). The only comments made that really irked me were those of the Vote Leave campaign chiefs. Paul Stephenson, Communications Director for Vote Leave, was reported to have said that “billboards are relics from another era”. This couldn’t be more wrong. In a world of ad-blocking and ad-free subscription services billboards are one of the few-remaining channels where you can guarantee reach and impact and you can buy them in the areas of the country where they’re most needed. Indeed, the latest data from the Institute of Practitioners in Advertising shows that outdoor advertising is the second most effective media channel (TV being the first). And I was surprised by Dominic Cummings, Vote Leave’s Campaign Director, comments that his “advice to people who want to improve communications is hire physicists, not communications people“. His tune seems to have changed dramatically since he told Campaign Magazine in February that he was looking to hire a “small, hungry and edgy agency that is not afraid to take risks and upset the government“. 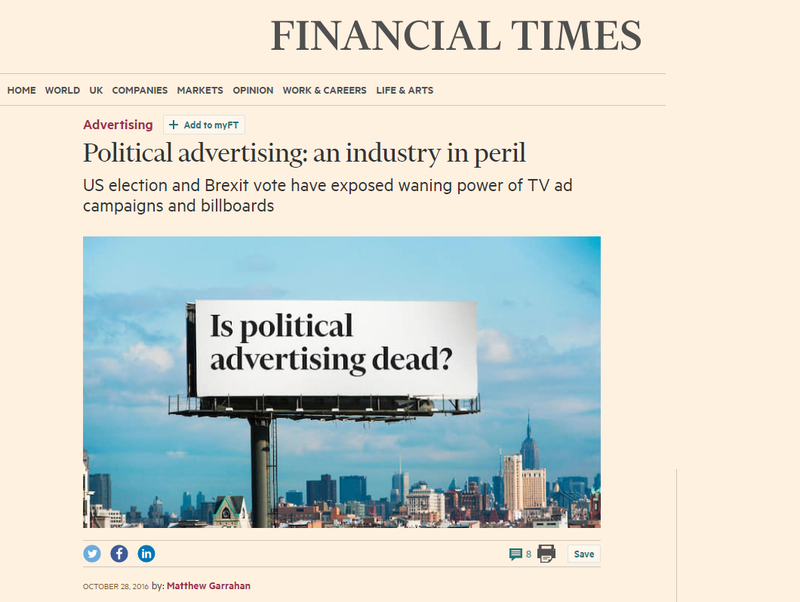 So, to summarise, a quick skim of Garrahan’s article might lead people to think that political advertising is in trouble, however those who finish the article will see that the author – correctly in my view – concludes that whilst the tools being used have changed, the discipline remains very much intact and “campaigns have not stopped selling to voters”.